Filter media for the best drinking water. Engineers across the world trust Porex for porous filter solutions to address complex design and engineering challenges in the consumer and recreational water filtration industries. With decades of material science expertise and filtration application experience, our global operations ensure high reproducibility and reliability of filter products throughout the supply chain. Increase filter life as our pre-filters and media support effectively filter out particles that cause fouling. POREX® carbon block pre-filters – also called seamless filters - offer advanced pre-filtration. Thick polyolefin walls allow for maximum flow and high efficiency, quickly removing sediment particulates from water. The seamless, unified design enables easy assembly while eliminating the risk of downstream contamination due to seam failure. Eliminate the need for a separate sediment filter - combines sediment and carbon block filtration in one step. Extend the life of carbon filters–Material quickly removes sediment particulates to extend product life. Eliminate challenges from seam failures–Durable one-piece construction of the material eliminates issues caused by seam failures. POREX® media support tubes, sleeves, outer wraps and cores improve the filtration and structural integrity of water filtration cartridges. Extend primary filter lifespan–Removal of carbon fines, dirt, rust and sediment extends the primary filter lifespan, including carbon blocks and RO filtration. Maximize flow and filtration efficiency–Structural integrity of porous tubes maximizes efficiency while removing sediment. Enhance filtration – Ability to tightly pack media into tubes prevents poor filtration due to channeling. Engineered for absolute fiber purity and consistency, POREX® melt blown filter cartridges provide optimized dirt-holding capacity, low-pressure drop, high filtration efficiency, and long lifespans. Entirely made of melt blown nylon microfibers, our melt blown filter cartridges are binder-free and thermally treated for reliable performance in the most challenging environments. Increase efficiency–Cartridges are engineered for optimal dirt-holding capacity and high filtration efficiency. Provide chemical and thermal resistance–Nylon structure provides exceptional chemical and thermal resistance. Media support disks improve the filtration and structural integrity of water filtration cartridges. Extend media lifespan–Removal of carbon fines, dirt, rust and sediment extends media lifespan. Maximize filtration efficiency–Structural integrity of porous tubes maximizes efficiency while removing sediment. 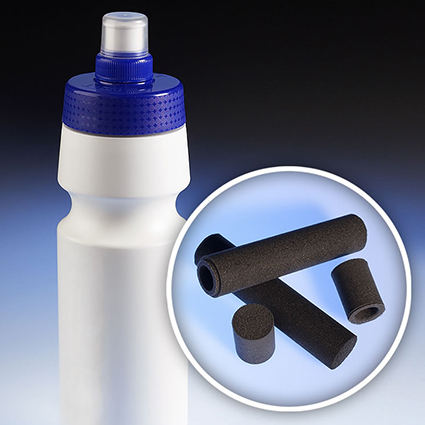 Designed for consumer water bottles, our carbon filters offer an easy, effective way to filter out pollutants and generate clean drinking water for consumers. Effectively remove chemicals–Filters chlorine for up to 50 gallons of tap water and effectively removes high solids and odors. Reduces environmental footprint–Replaces over 350 single-use water bottles, reducing impact on local landfills. *POREX® Carbon Filters have been tested by internal and third-party laboratories @ 0.3 L/min flow.